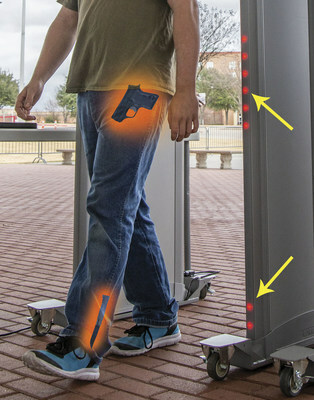 GARLAND, Texas, Jan. 22, 2019 /PRNewswire/ -- Texas-based Garrett Metal Detectors is pleased to announce the release of a new security walk-through metal detector designed to meet both the advanced performance and budget needs of schools, special events, loss prevention, mass transit, and other security applications. Garrett's new MZ 6100 Multi-Zone Walk-Through Metal Detector provides precise location of one or more metal objects simultaneously. "The Garrett engineering team has really stepped up with the design of the MZ 6100 in order to meet the changing landscape of today's security needs," said Garrett CEO Steve Novakovich. The MZ 6100, which includes 20 detection zones, was designed to be user-friendly for the operator. Examples of this are: an intuitive menu design with clear prompts; a convenient slider bar to quickly adjust the value of a detector setting; pre-set programs geared to meet the needs of specific security applications; and an Auto-Scan function where the MZ 6100 automatically selects the optimal operating frequency for environmental noise cancellation. High intensity LED indicators on the detector—five times brighter than the indicator lights on some machines—are highly visible, even in direct sunlight. When equipped with optional casters and a backup battery, the MZ 6100 is fully portable for deployment without the use of power cables. In addition to such versatility, the unit is protected from tampering by several layers of access control. Garrett's new security screening walk-through metal detector was unveiled today in Las Vegas at the 2019 SHOT Show, the world's largest trade show for products and manufacturers involved in the shooting sports, hunting, outdoor, and law enforcement industries. Garrett Metal Detectors, co-founded by 84-year-old, fourth generation educator Eleanor Smith Garrett, is the global leader of metal detection products for security and law enforcement applications worldwide. For 55 years, Garrett has engineered the most advanced metal detection products, including walk-through, hand-held, and ground search metal detectors for the security industry. Garrett is an International Standards Organization (ISO) 9001:2015 certified company.